One of Japan's biggest breweries provides tonight beer, Suntory. To be more specific it is the Magnum Dry a Happoshu, a style of beer I have never had and have very little knowledge of. There appears to be some debate in the wider beer community whether this is actually a beer style. Happoshu is a Japanese style of beer that is ostensibly produced to avoid tax. The Japanese tax division for beer are base on malt content. Over the years the Government have lowered the tax threshold to the point now where Happoshu now has to have less than 25% malt. I hope tasting this beer will answer if this is actually a beer style for me. Let's find out! The first thing I have to say is that when you pour this beer it looks like a normal lager. A yellow golden liquid with lots of carbonation rising to an off-white head of quite impressive size. The retention of the head is very good, probably due to the apparent carbonation, and the lacing is reasonable. All-in-all a good start for this beer. Similarly it smells not hugely different from a lager. It's very mild with only some hints of sour grain and a very brief hop note towards the end. As the beer warms you get a slightly sweet aroma but I cannot place exactly what this is. By no means does this beer have an appealing aroma, but it I apply my lager rule it's not offensive so thats all that matters. 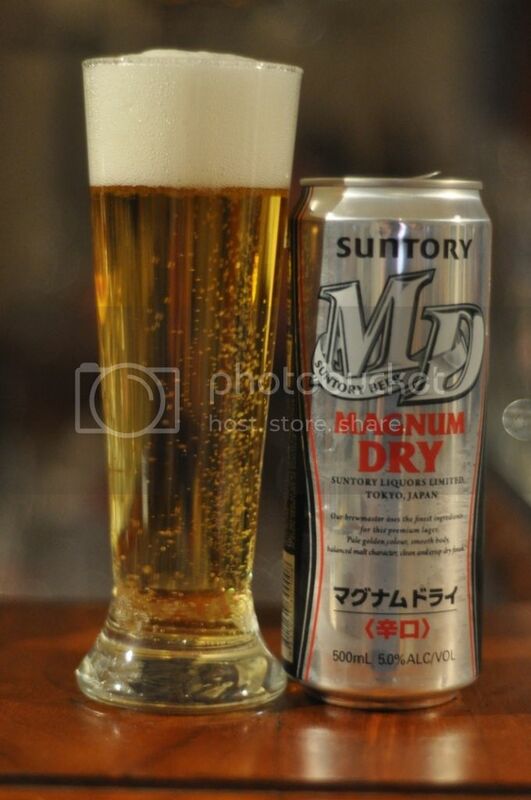 For what is supposedly a low-malt beer, Suntory Magnum Dry seems to have quite a bit of malt on the palate. There are also some hops present which gives the beer a more balanced flavour. The carbonation is actually a little high and the mouthfeel is very thin. The beer is refreshing though, you have to give it that. In terms of calling Happoshu a beer style on the evidence presented by Suntory Magnum Dry, I'm happy to say that I believe it is. Basically this was for me an average lager, which I probably wouldn't go out of my way to get again. I always like trying new styles and for the price I'm happy I bought this one. If you are looking for a really cheap 4-pack of cans you could do alot worse than picking this one up.